Twice in recent months I have underestimated the time required to edit a book by a first-time author, which cost me valuable income. After years of freelance writing, and now editing, I am convinced that no matter what the job you will be best be served if you take your time in estimating costs. In coming up with mine, I like to edit a chapter (or part of it) to gauge the total number of hours it will take to complete the work. Experience has taught me that I should then add a third to that figure and I will be more likely to hit the target. With the first job, the author and I agreed on a $500 advance to edit the first portion. When I finished, I reasoned that I could do each portion of the remainder in slightly less time. After all, there would be less of the initial minutiae—copyright translation notices and introductory material—involved. Or so I thought. When I got to the end of the process, I saw there were other factors I should have considered. Factors that cost me more than $500. Had I stopped and used a calculator to come up with a clearer estimate, and added a cushion for the unexpected, I wouldn’t have made that mistake. The second job involved a man who had written a book to teach a class at his church. He wanted to get it professionally-edited and self-publish it for a wider audience. Since he seemed fairly interested in going ahead, I reviewed only a third of the first chapter before using a standard per-word charge based on the overall length of the book. Had I gone a little further before pricing that project, I would have seen a surfeit of awkward phrasing, repetition, and needless material that needed handled. I wound up deleting about twenty-five percent of the original draft. In addition, I marked around seventy-five footnotes requiring attribution or proper sourcing information. Trying to be helpful, I looked up book titles when possible, and in several cases found article sources online to reduce the time he would need to hunt all this stuff down. Naturally, this took time I hadn’t figured on because I hadn’t looked over enough of the material before giving him my estimate. Now, I don’t regret working on either one of these books. They contained scripture-based, interesting material, and the latter had some fascinating historical perspective that were quite educational. Still, I learned my lesson. Recently, another first-time author wanted to know if I would edit her book for a very low price. I took a serious look at it before telling her I would need more than twice what she suggested. She wound up hiring someone willing to do it her for her price. I’m not sorry I lost that job. 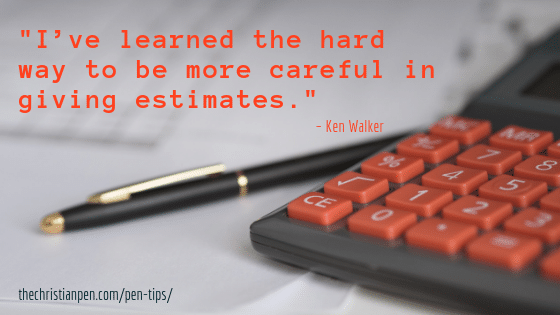 I’ve learned the hard way to be more careful in giving estimates—and then sticking with them. Experienced. Award-winning. Skilled. For years, Ken Walker has been shaping stories—thousands of them—for books and articles in various venues. 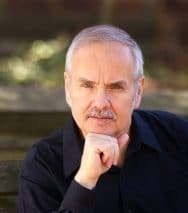 He uses his writing and editing talent now to help edit and refine authors’ material, as well as coaching bloggers and other writers on how they can improve their material. In recent years Ken has co-authored or edited more than a dozen health-oriented books. This specialty began with co-authoring Winning the Food Fight, a book that emerged from Jamie Oliver’s Food Revolution, an Emmy-Award-winning mini-series on ABC.